This card was created by my friend and customer Colleen. I think she likes her coffee almost as much as I do! So I was delighted when this, one of her swap cards, featured the Coffee Break suite of products. How cute is this?! And do you see the oval underneath the sentiment? It’s CORK! Yes – actual cork, hand cut to size! No one can say that Colleen doesn’t go the extra mile on her cards! Since Colleen used mainly Stampin’ Up! products, I can pretty much figure out how she created this card. The card base is Pear Pizzazz cardstock, measuring 5 1/2 X 8 1/2. Score at 2 1/8″ and 6 3/8″, and fold on the score lines inwards, to create the 2 front ‘flaps’. Cut 2 pieces of the Coffee Break Designer Series Paper (cup rings pattern) 1/4″ smaller than each front flap, and attach with Multipurpose Liquid Glue. 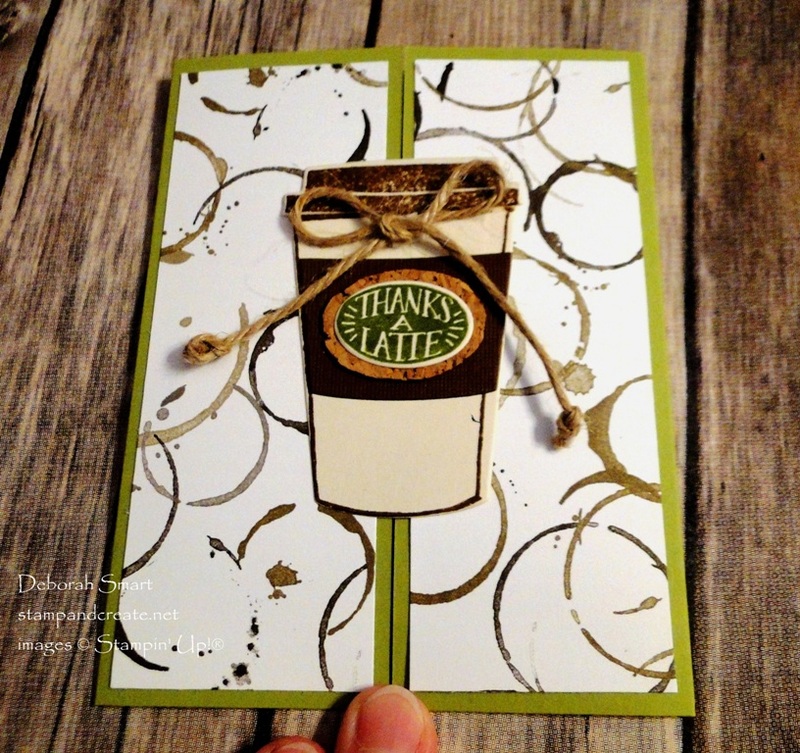 If you don’t have the DSP, you can create your own by stamping the coffee rings image with the Timeless Textures stamp set. Stamp the cup outline and solid lid from the Coffee Cafe stamp set, in Early Espresso ink onto Very Vanilla cardstock; stamp the sentiment in Garden Green ink. Use the Big Shot with the Coffee Cups Framelits to die cut the lid, cup and sentiment. Colleen then hand cut the piece of cork so that it is about 1/4″ bigger than the sentiment die cut. Build your cup by layering the pieces together with Stampin’ Dimensionals, or Mini Glue Dots. Colleen finished off the coffee cup by tying a bow with a piece of jute twine; you could use our Linen Thread, or a Baker’s Twine if you wanted. A card this great has to have an equally awesome inside, right? Well, Colleen didn’t disappoint! She stamped the large sentiment in Early Espresso ink onto a large die cut piece of white cardstock. 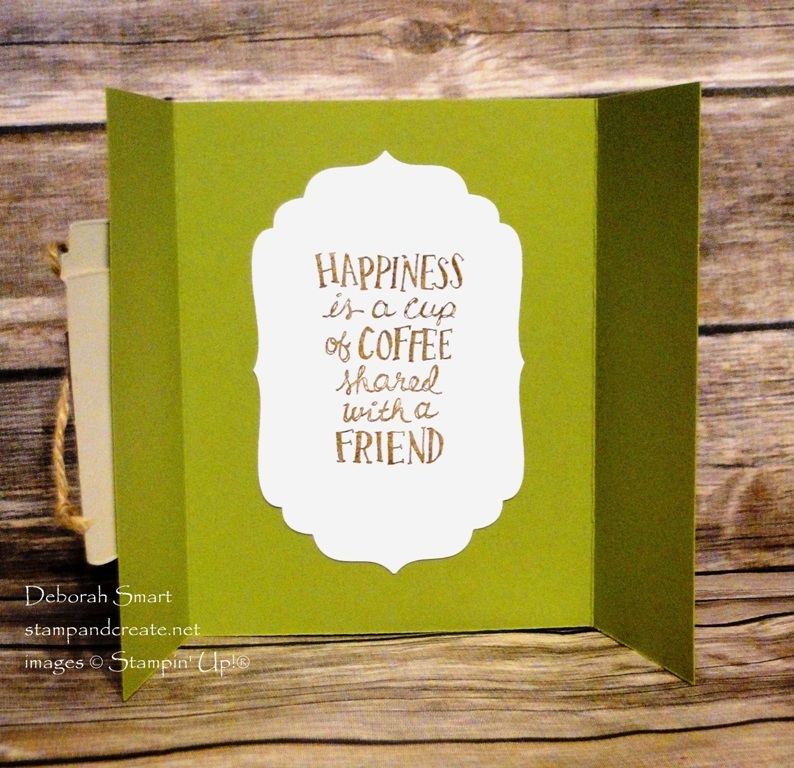 MAKE YOUR OWN COFFEE BREAK FUN FOLD CARD! I always appreciate your business, and your spending time with me here at my blog! If you have any questions or comments, please feel free to leave one – I love reading what you have to say! Next Next post: Have You Noticed My New Look!